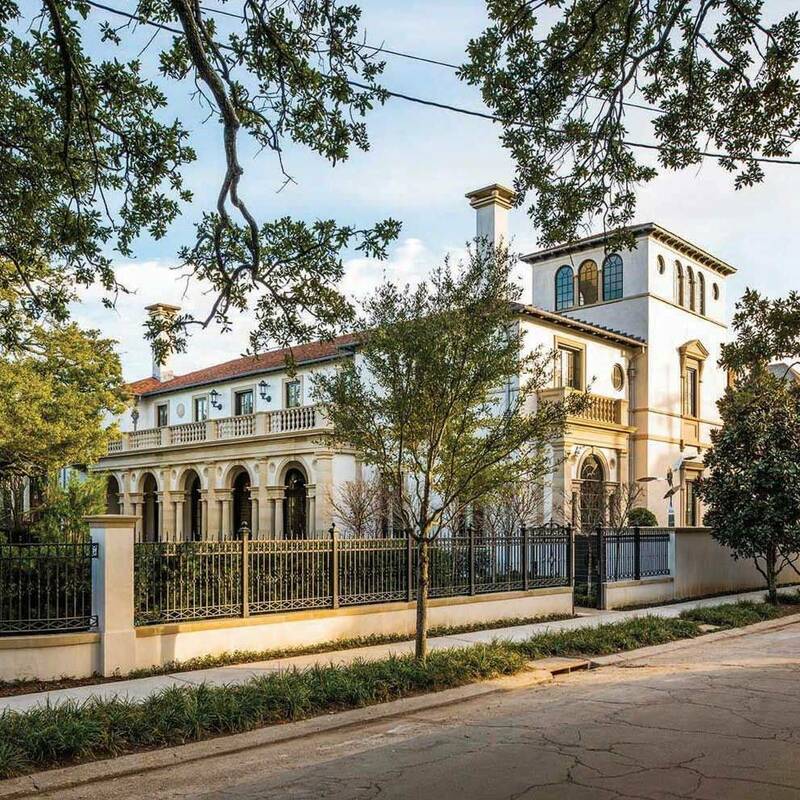 Located in the famed St. Charles Avenue Historical District of New Orleans, Urban Villa combines classical elements inspired by the architecture of Andrea Palladio with the romantic character of the Mediterranean Revival. The architect designed the 12,800 ft² home to look like it was part of the historic era, but not merely a replica. Inspired by Palladio’s Basilica in Vicenza, he settled on a stucco and masonry-clad design with cut-limestone architectural details. The villa’s front portico rises just a single-story, without a typical pediment, and is detailed with a cut-stone arcade and balustrade terrace above. 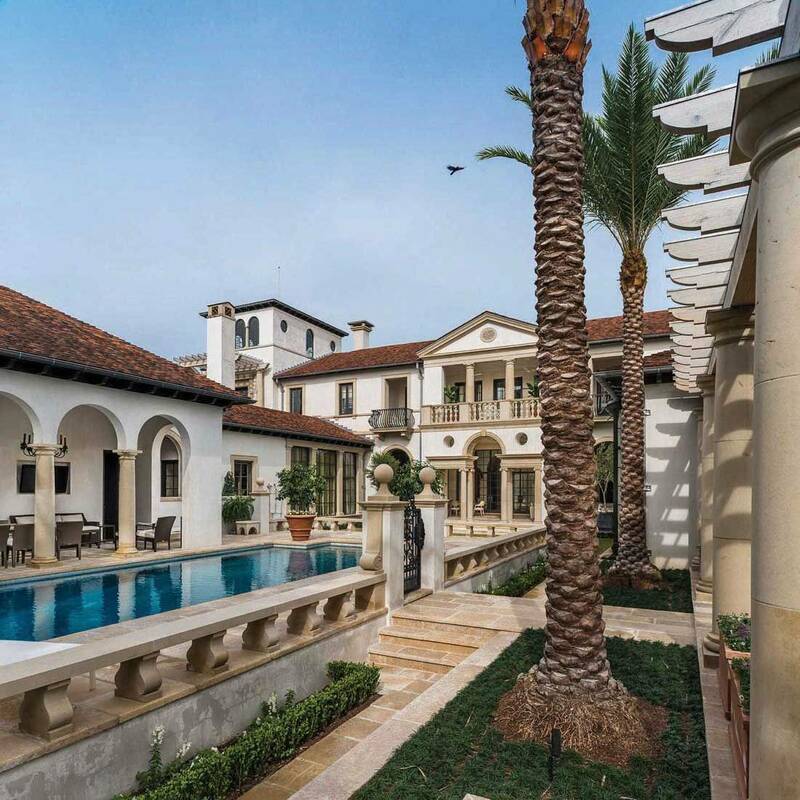 Located on a corner lot, the house has a secondary façade with picturesque Mediterranean Revival features, including iron gates, a second-story pergola, and a tower. Accommodating the client’s art collection, interior plans combine smooth plaster walls and simple casings with adorned ceilings, including groin and barrel vaults, beams and paneling. 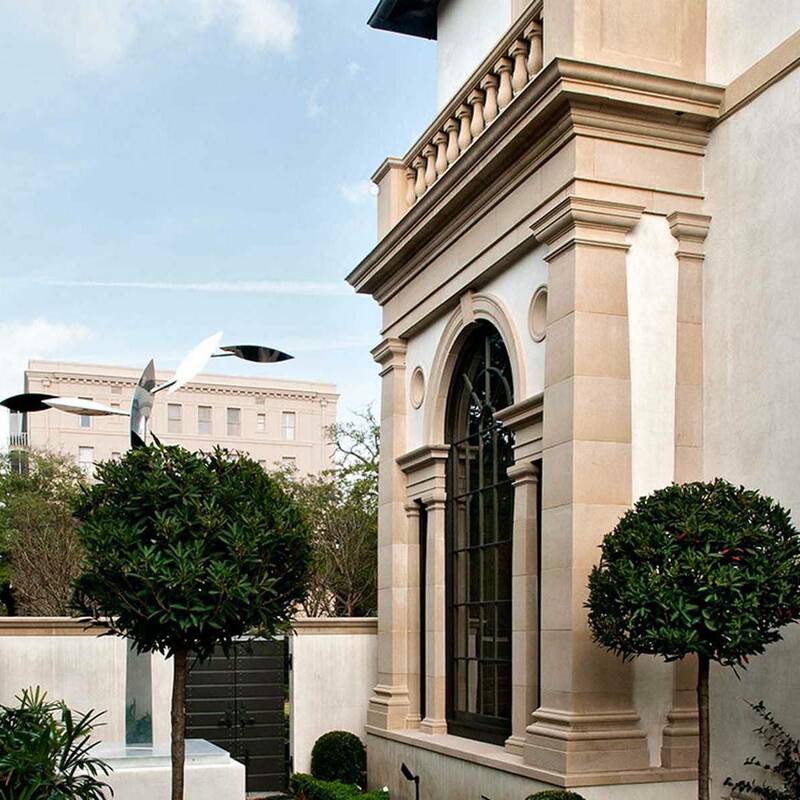 Lueders Buff limestone was used for all of the cut-stone material -- both interior and exterior. 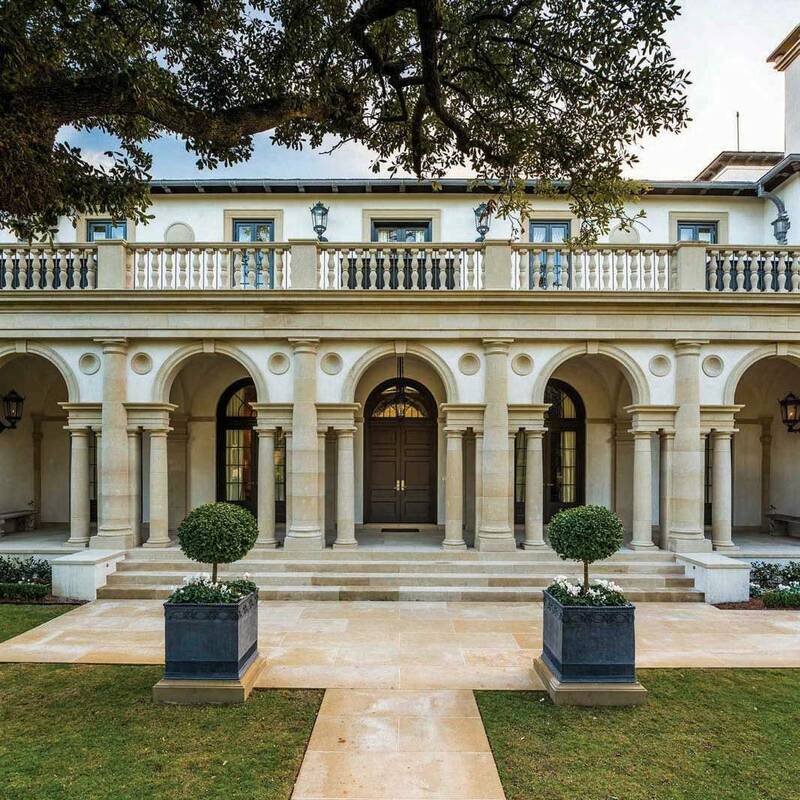 Many intricate details throughout the project required attention to detail in both drafting and fabrication, especially the engaged columns at the front portico. All surfaces of the cut-limestone pieces were hand-distressed in a subtle manner to enhance the inherent aspects of the stone. Characteristics of the Lueders limestone selected lent greatly to the carving aesthetic, such as a hand-carved Palladian mantel, and helped to achieve the timeless quality that the architect originally sought for the project. 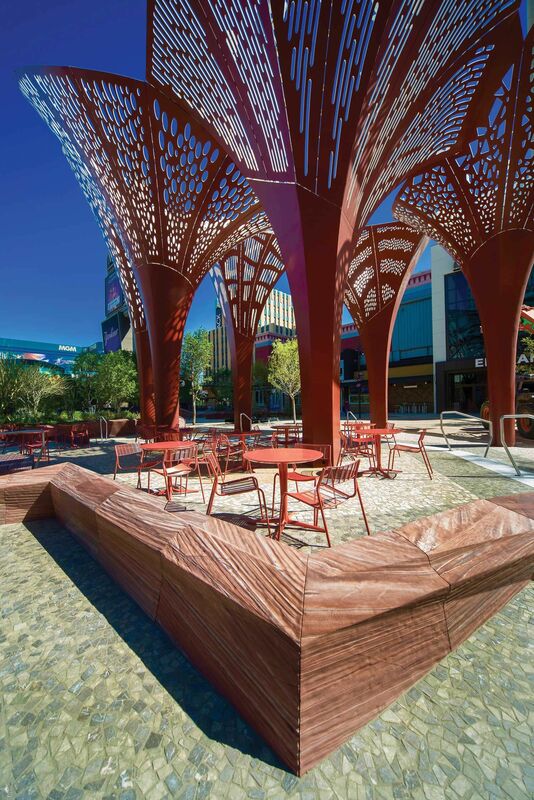 The Park is a lush promenade featuring avant-garde stone planters, native plantings, monumental shade structures, and cascading water walls offering a refuge from the hustle and bustle of the Las Vegas Strip. 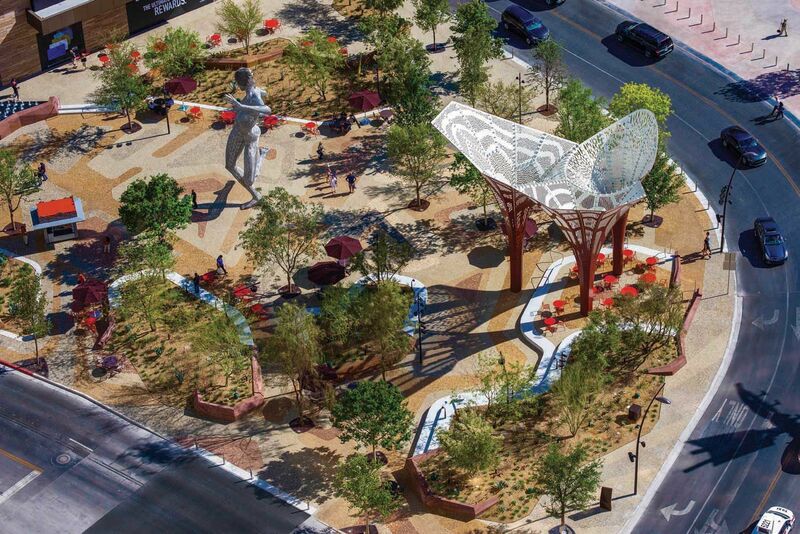 The goal was to create a space where stunning desert landscapes and cutting-edge design work in harmony, inspired by the city’s context, history, and landscape. 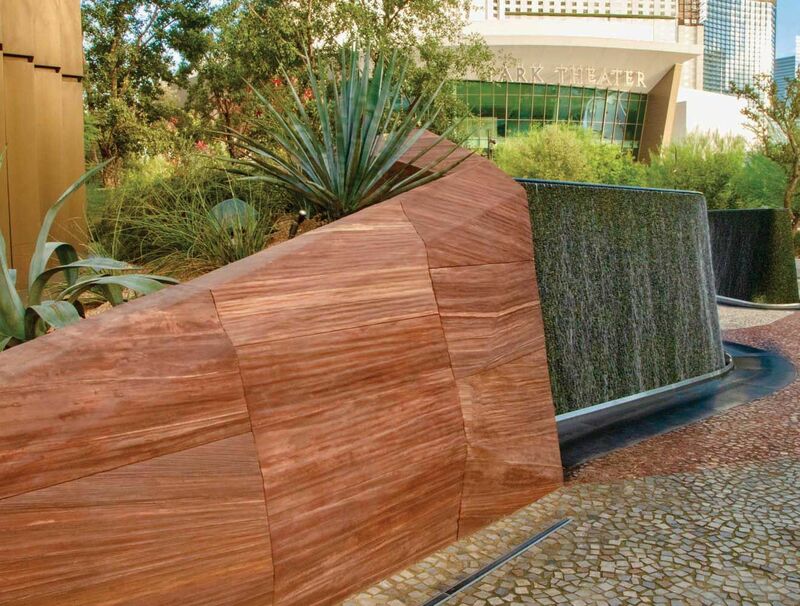 Metaquartzite supplied by Las Vegas Rock offers vivid strata variations and introduces colors that are characteristic of the southwestern landscape to Las Vegas Boulevard, reminiscent of some of Nevada’s most-iconic natural landmarks. Created by nature and crafted by man, metaquartzite mirrors the dual worlds that intersect within The Park. To achieve the multi-dimensional surfaces of The Park’s crystal shaped planters, the most-advanced stone-cutting technology was required. Using seven-axes wire saws acquired specifically for the project, 3D computer programming was utilized to carefully slice the massive pieces of rock from multiple directions and angles. Of the total 596 crystals created, no two are identical. Eighty-six of the crystals presented distinct challenges of unique complicated contours, double-sided complex geometries, or giant assemblages that had to fit together ﬂawlessly. To assure fit and accuracy, every piece was pre-assembled. Overall, 2,225 linear feet of metaquartzite crystals were 3D cut, pre-assembled, and finished to a windswept appearance. 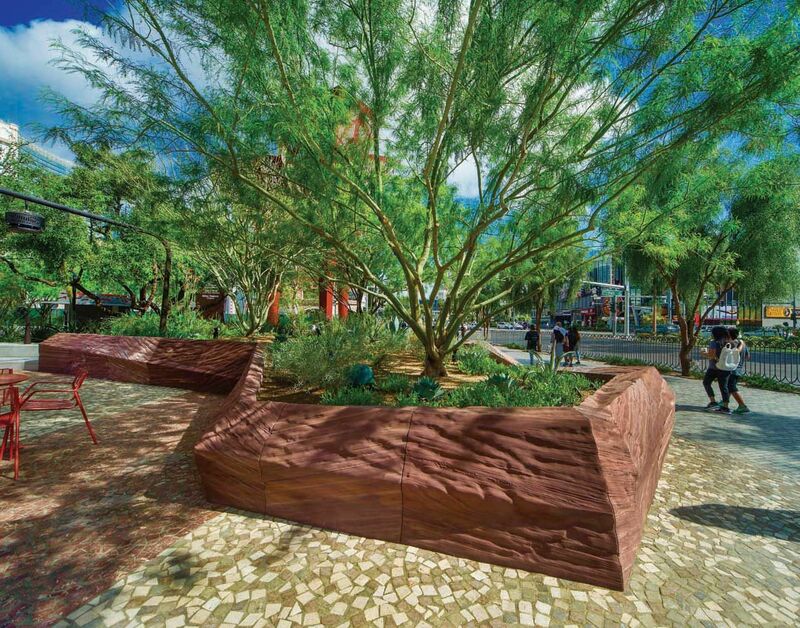 As one of its most prolific building elements, metaquartzite contributed to The Park’s intricate sustainability requirements that in many ways, represents a return to the land for a city whose development history has traditionally stood in stark contrast to its native ecology.